Before addressing the main subject matter, we first need to take sufficient time to preface the importance of understanding what the “fruit of the vine” means, when speaking of the Passover emblem in the New Testament. While it's close to the time of Passover and the Days of Unleavened Bread, it’s fitting to think about the following and about some of the symbolism, and what is happening in our own time, just as what has happened in times past. While this was said back in the time just prior to the Babylonian captivity of Judah, we find that similar false teachings and religions ruled by men, rather than by the hand of Yahweh, are the norm and not the exception, in our own time. It was also this way back in the Messiah’s time with the Pharisees and Sadducees. Be diligent to present yourself approved to Elohim as a workman who does not need to be ashamed, accurately handling the word of truth. But avoid worldly and empty chatter, for it will lead to further unrighteousness, and their talk will spread like gangrene. Among them are Hymenaeus and Philetus, men who have gone astray from the truth saying that the resurrection has already taken place, and they upset the faith of some, 2 Timothy 2:15–18 NASB. What else is like gangrene? How about cancer? Is either one something we want in the body of Messiah? How do you get rid of gangrene or cancer? If you can’t cure it, it has to be cut out. This is why disfellowshipping someone is appropriate, if they are spreading false doctrine and won’t stop. Hymenaeus and Philetus, mentioned in a letter by Paul, were men who were doing what? These men could have been very loving, caring, outgoing, having many who loved them. Yet, they were teaching false doctrines. They may have sounded like saints, but once you start speaking things that aren’t truth, then what? In the body of Messiah, it has to be dealt with. Paul identified these men, Hymenaeus and Philetus, probably already having debated with them, as problem individuals in the assembly. This was done not because of the fact that they were harsh or not being friendly and caring, but because they simply were teaching a false doctrine, something that just was not true according to Scripture, nor to the reality of their day. Could this have been the first time the doctrine of “going to heaven” was being taught? How prevalent is this false doctrine today? Did it spread from this point nearly 2,000 years ago into the main-stream teaching we see today? Maybe they were saying, with gentle voices, “look, the resurrection of the dead has already taken place, but they are invisible and in heaven now. ....Hey, it’s just a matter of time before we are also changed.” Can you hear them talk? Were they loving and kind and gentle? But what they were teaching was cancerous, gangrenous, and	leavenish, which continues to spread with seemingly no end in sight. “Be	careful,” Yahshua said to them. “Be on your guard against the yeast of the Pharisees and Sadducees.” They discussed this among themselves and said, “It is because we didn’t bring any bread.” Aware of their discussion, Yahshua asked, “You of little faith, why are you talking among yourselvesabouthavingnobread?D‎‎o you still not understand? Don’t you remember the five loaves for the five thousand, and how many basketfuls you gathered? Or the seven loaves for the four thousand, and how many basketfuls you gathered? How is it you don’t understand that I was not talking to you about bread? But be on your guard against the yeast of the Pharisees and Sadducees.” Then they understood that He was not telling them to guard against the yeast used in bread, but against the teaching of the Pharisees and Sadducees, Matthew 16:6–12 NIV. When we clean out the leavening and we’re doing our general spring cleaning, it’s sometimes easy to miss an ingredient, like yeast, while going through all the labels that we have to go through. Bible study, while going through the various instructions, helps us to see where maybe we were a little off on our understanding. This is what personally happened to my wife and me some years ago. And, once we found leavening within what we thought was pure, it awakened us to take notice of other areas which we maybe needed to take a closer look at. Leavening, like that of the Pharisees and Sadducees, is pretty selfevident in many ways. But leavening can also be very subtle, to the point where we really don’t see it as such a bad thing. Yet, it still is associated with sin, and sin causes death. So, it needs to be dealt with. We can’t compromise with anything like gangrene. It’s too dangerous. I appeal to you,brothers, by the name of our Master Yahshua Messiah, that all of you agree, and that there be no divisions among you, but that you be united in the same mind and the same judgment, 1 Corinthians 1:10 ES. Can we be of the same mind and judgment? Yes. Can we love one another? Yes. Clinging to the trustworthy word, according to the teaching, in order to be able both to encourage by sound teaching, and to reprove those who oppose it. It’s encouraging to hear the truth spoken. Those that disregard it should be reproved, so that they’ll be ashamed and repent. It’s not just to make them feel bad; it’s so they’ll turn back to the truth and not get further off track to the point they no longer have any of Yahweh’s Spirit working in them, but rather Satan’s spirit and influence. For I know this, that after my departure savage wolves shall come in among you, not sparing the flock. Also, from among yourselves men shall arise, speaking distorted teachings, to draw away the taught ones after themselves. Therefore watch, remembering that for three years, night and day, I did not cease to warn each one with tears, Acts 20:29–31 TS. Paul could foresee what was coming.Hewasalreadydealing with problems and with attitudes of unrighteous men trying to have their own way and do their own thing, while disregarding Yahweh’s Word. Having a form of righteousness, but denying the power thereof, 2 Tim. 3:5a AV. As I urged you when I went into Macedonia, stay there in Ephesus so that you may command certain people not to teach false doctrines any longer, 1 Timothy 1:3 NIV. Deal with falsehood, command those teaching such things to stop. This was Paul’s instruction to Timothy. It’s one thing to have a Bible study and consider how some interpret a verse, but it’s another to hold on to a false interpretation and promote it as the truth. For years, my wife and I were with a group that taught wine was what was to be taken with unleavened bread in the New Testament Passover memorial. It was the discovery, or rather the revelation, that this was not correct which opened up our eyes to the fact that we also needed to reexamine some other areas of doctrine which we had held for years as the absolute truth. It may be that the following may now be of help to you and yours, to see something you may have missed before. The evidence about to be presented is not just one thing, but many things which conform to basic truths. But first, we have to start by asking a question: Is the Passover cup in the New Testament to contain fermented or unfermented fruit of the vine? Moving beyond the preface, but having it as a foundation, let’s now take a look at the “fruit of the vine,” and discern if it is speaking of an unfermented or a fermented drink relative to the contents of the Passover cup. 1. Storage: Could grape juice be stored for any length of time after grapes were harvested at the end of summer going into the fall Festivals? Could it last into the spring appointed times? 2. New Wine: Can new wine be placed in old wineskins? What is new wine? Fermented or not? After all, there is yeast on the skins of the grapes and getting mixed in with the juice would just speed the process. Right? 3. Hebrew and Greek Words: What are the Hebrew and Greek words for wine and grape juice? 4. Symbolism: What symbolism is there in wine vs. grape juice? Can’t “fruit of the vine” represent both? Which is more appropriate for the Savior? 5. Wine Vinegar: Can vinegar be a wine? And why is it important to know? 6. Worship and Wine: Is wine or any fermented drink allowed to be consumed by priests or members in any worship service to Yahweh? The question that is often brought up is: “Could grape juice be stored for use throughout the year?” The reality is that we just need to answer if it could be preserved until the spring, from the time it is harvested just prior to the Fall Feasts arriving. Let’s get back to the question at hand, "Could grape juice be stored for any length of time after grapes were harvested at the end of summer going into the fall Festivals?" or "Could it last into the spring appointed times?" The acting manager for an operational vineyard in Israel, in answering this type of question, wrote, “In my opinion the atmosphere 2,000 years ago was not as polluted as it is now and the number of yeasts and bacteria in it was far less. If this is true, then it could have been possible in ancient times (2,000 years ago) to avert fermentation by hermetical closure of the containers,” said Alfred Steller, Acting Manager of Rishon-le-Zion Winery. Besides storing just the juice, it could be stored by other means and then reconstituted. These techniques were already known by the Egyptians, and no doubt would have been learned by the Israelites when they were there. “The Holy Land has rightly been called ‘the land of grapes’... the grapes provided juice that was boiled down to the consistency of molasses,” Nelson’s Illustrated Encyclopedia of Bible Facts. This would be like making grape jam. Before Passover, we will at times send individual grape jam packages to prisoners. They can take it and reconstitute it back into grape juice, simply by adding water and stirring it. Raisins would have the same capacity to be dried, stored, and then used at a later date. This pretty well answers, in the affirmative, that grape juice indeed can be stored for some length of time, but exporters could have actually brought in fresh grape juice from other areas. Jerusalem’s trade went beyond its own borders. Trade routes were well established during King Solomon’s time, reaching into other countries and other trade routes, some existing during the 1st century of the Common Era for Jerusalem. Other questions arise, however,so let's look at the subject of "New Wine." Can new wine be placed in old wineskins? What is new wine? Is it fermented or not? After all, there is yeast on the skins of the grapes and getting mixed in with the juice would just speed the process. Right? Thus saith Yahweh, as the new wine is found in the cluster, and one saith, destroy it not; for a blessing is in it: so will I do for My servants’ sakes, that I may not destroy them all, Isaiah 65:8 KJV. is like calling a grape juice press a wine press, since ultimately grape juice can eventually be made into wine. In studying this wording, “new wine,” it looks like there are some situations in which new wine is used in the Old Testament as grape juice (for example, when it is described with other first fruits). But, in the New Testament, it appears to only be pointing to grape juice which has already started fermenting, and, hence, called new wine. Not one word as in Hebrew, but two words in Greek. A change in the meanings of words is commonly known. This is how some counterfeiters are caught when they use current Hebrew words, which are not appropriate for the time period of the artifact they are trying to pawn off as authentic. One such artifact was supposedly a document giving Hebrew workers the go-ahead to work on the Temple of Yahweh, but the word for "build" later meant the exact opposite. So, the document was noted as a forgery because it was saying that the workers were given the go-ahead to tear down the Temple. Obviously, the person did not understand the Hebrew language for that particular time period. Neither do they put new wine into old wineskins, or else the wineskins burst, and the wine is spilled, and the wineskins are ruined. But they put new wine into fresh wineskins, and both are preserved, Matthew 9:17 NASB. Interesting, the new wine can be preserved in animal skins called wine skins. But were there not two ways of preservation? One in which they could be kept cool, say under water for unfermented fruit of the vine, and the other in which it would be placed in the natural warmth of the air to ferment into wine? 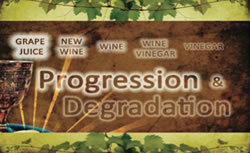 In thinking about and looking at this in context, Yahshua used the example of no one using a patch of unshrunken cloth on an old garment in the previous sentence, which tells us that He’s using new wine in the sense of the fermentation process having started and is going to continue to stretch out the wineskin. Since it’s a new wineskin, it will stretch. But old wineskin, already used to allow new wine to ferment, would only rupture because it had already been stretched out. Hence, while unfermented grape juice could have been stored in a cool place, such as under water, this example of "new wine" was already in process and was fermenting. It may have had yeast already mixed in to help the process along which is a common practice today. To store grape juice, they most likely would have known about boiling items to preserve them. This is a way to make sure the natural enzymes of the fruits would not destroy the juice and eventually make it rotten. Brick ovens, by the way, were used in Sumer and also in Egypt, as early as 2500 BCE. The Exodus occurred some 1,000 years later. According to the archeological finds, the Sumerians were the first to have top ranges for boiling and frying. Would the Israelites have learned any of the preservation techniques that the other cultures had? It’s a given that they would have learned a few things. What can we learn if we examine the languages? Let's move on to the next subject and question. What are the Hebrew and Greek words for wine and grape juice? “New wine,” in Hebrew, is one word, tyrosh (#8492), and in the Greek it is two words, neos oinos (literally, new wine). The scholars appear to agree that the wording indicates that it is a juice which is in “the beginning stage of fermentation.” As already mentioned, context has to be considered with some of these words, but it does appear that usually the term “new wine” (at least in the New Testament) is already in the fermenting process, though not too far past just plain good old grape juice. In the Old Testament, we find the word for “grape “ is enab (#6025). Then they said to him, “We have had a dream and there is no one to interpret it.” Then Joseph said to them, “Do not interpretations belong to Elohim? Tell it to me, please.” So the chief cupbearer told his dream to Joseph, and said to him, “In my dream, behold, there was a vine in front of me; and on the vine were three branches. And as it was budding, its blossoms came out, and its clusters produced ripe grapes. Now Pharaoh’s cup was in my hand; so I took the grapes and squeezed them into Pharaoh’s cup, and I put the cup into Pharaoh’s hand,” Genesis 40:8–11 NASB. The Hebrew word for “grape” is enab. For “grape juice” it is enab mishrah, but for “wine” it is yayin (#3196). Speak to the Israelites and say to them: If a man or woman wants to make a special vow, a vow of dedication to Yahweh as a Nazirite, they must abstain from wine and other fermented drink and must not drink vinegar made from wine or other fermented drink. They must not drink grape juice or eat grapes or raisins, Numbers 6:2–3 NIV. “Grape juice” (enab mishrah) is a term not used in the New Testament. “Fruit of the vine” is a term, which apparently didn’t show up until New Testament times, and should be able to mean anything from “grape juice” to “wine.” In context of the Passover, it is the only term used. The term for “wine” in the New Testment, either “new wine” (neos oinos) or just “wine” (oinos), is not. This is very significant, as we find that the Bible we have is not put together haphazardly. There are reasons why certain wording is the way it is. It’s for us to discern right from wrong, truth from tradition. The words and their meanings help us to do so, and as mentioned before, my wife and I could hardly believe how easy it was to discern that we had been taking the wrong emblem of wine for the Passover cup. It was a real eye opener, as “wine” (oinos) is never used in combination with the Passover, and there are very good reasons why, as we’ll find out, when we get into the symbolism of it. First, let’s get into some of the Greek words. The word “drunk” is methusko and it definitely has the meaning of “getting intoxicated” here. It stems from the word methuo, which is one of the few Greek words that can essentially have two meanings, depending on context. For when you are eating, some of you go ahead with your own private suppers. As a result, one person remains hungry and another gets drunk, 1 Corinthians 11:21 NIV. The word “drunk” is the translation of the Hebrew methuo, and not methusko. This word methuo has the meaning here of filled up, but not drunk as in intoxicated. So the same thing could have been worded like this: “one person remains hungry and another gets full.” Or, “one person remains hungry and another gets saturated.” But, saturated does not necessarily mean intoxicated. The evidence is in the first recorded miracle of Yahshua at the wedding in Cana. When the master of the feast tasted the water now become wine, and did not know where it came from (though the servants who had drawn the water knew), the master of the feast called the bridegroom ‎‎and said to him, “Everyone serves the good wine first, and when people have drunk freely, then the poor wine. But you have kept the good wine until now,” John 2:9-10 ESV. Oinos is what Yahshua made. However, what He didn’t do, because of His righteous character, was give intoxicated people more intoxicating drink to further get smashed. Some may say it was grape juice that Yahshua made, not wine. However, the Greek word oinos specifies fermented wine. So the confusion stems from the word methuo being translated as drunk (as in intoxicated drunk) rather than filled up or having had plenty. One can have a glass of wine and drink plenty, and be full from that, but not be intoxicated as in one who is drunk. “Fruit of the vine,” in Greek, is “genema ho ampelos.” When we consider the question of “genema ho ampelos” and whether or not it is fermented, we are to consider it in context. We'll do this, but first let’s look at the symbolism of wine vs. grape juice. What symbolism is there in wine vs. grape juice? Can’t “fruit of the vine” represent both? Which is more appropriate for the Savior? As a so-called wine press is squeezing grapes, what is the first thing to appear? Grape juice, right? It’s not wine. We can all agree, in the affirmative, that the very first juice from a winepress is actually fresh, squeezed, and unfermented grape juice, and not fermented wine which can ultimately be produced. But now Messiah has been raised from the dead, and has become the first-fruit of those having fallen asleep. For since death is through a man, resurrection of the dead is also through a Man. For as all die in Ad?am, so also all shall be made alive in Messiah. And each in his own order: Messiah the first-fruits, then those who are of Messiah at His coming, 1 Corinthians 15:20-23 TS. Young’s Literal Translation translated the last first fruits as singular, first fruit, which is fitting. Messiah is the First Fruit. Symbolic of fresh squeezed grape juice, which produces a symbolic blood. There is reference to the “blood of grapes” in Scripture, Gen. 49:11 and Deut. 32:14. Yahshua was pure. The very first pressing produces the "blood of grapes" in its purist form, before progression and degradation occurs. Wine is a mocker, strong drink is raging: and whosoever is deceived thereby is not wise, Proverbs 20:1 KJV. Do we think of Yahshua as a mocker or as a deceiver? Absolutely not. And there followed another angel, saying, Babylon is fallen, is fallen, that great city, because she made all nations drink of the wine of the wrath of her fornication, Revelation 14:8 KJV. Wine of the wrath of fornication? Is this in any way fitting for our Passover Lamb? What is the “fruit of the vine” speaking of in the New Testament and in context of the Passover cup? Let's consider the next product in line from the pressing to get grape juice, the fruit of the vine, which in turn led to new wine, which then ended up as wine. After this is wine vinegar. Can vinegar be a wine? And why is it important to know? Vinegar is essentially the end of the process of wine going bad, eventually getting to pure vinegar. Not something you want to drink. But, before it gets to pure vinegar, it is, in essence, wine vinegar. No one would serve wine going bad at a wedding. However, soldiers, or anyone poor, would more readily be able to get hold of any wine that was already going bad by those wanting to get rid of it. The Greek terms for “wine“ (oinos), “vinegar” (oxos), or even a type of intoxicating phrase such as “full of new wine,” used once in Acts 2:13, were never used by Yahshua to describe the “fruit of the vine” (genemma ho ampelos) for the Passover cup. “Fruit of the vine” is “pure grape juice.” It’s not the by-product called wine. Yahshua never lied and will not lie, and just like His Father, He doesn’t change. His righteous character stays righteous. But I say unto you, I will not drink henceforth of this fruit of the vine, until that day when I drink it new with you in My Father’s kingdom, Matthew 26:29 KJV. What is Yahshua referring to? Oinos (wine), neos oinos (new wine)? No, simply genemma ho ampelos (fruit of the vine). He is making a distinction and we are also to make the distinction. After this, Yahshua, knowing that all things had already been accomplished, to fulfill the Scripture, said, “I am thirsty.” A jar full of sour wine was standing there; so they put a sponge full of the sour wine upon a branch of hyssop and brought it up to His mouth. Therefore when Yahshua had received the sour wine, He said, “It is finished!” And He bowed His head and gave up His spirit, John 19:28–30 NASB. What did Yahshua accept before He died? Wine vinegar. Did He lie to His disciples? No, because it was not wine in the Passover cup, but grape juice. Plain, simple, and easy to prove. Yahshua is not a liar, He will drink the fruit of the vine, anew, in the Kingdom with His taught ones. That is, in context of what we’ve been looking at, unadulterated grape juice. If all of this isn't enough evidence, we’re going to now consider what we find in the law. Is wine or any fermented drink allowed to be consumed by priests or members in any worship service to Yahweh? O.K. What is the purpose of the law? The purpose of the law is to tell us what is holy and what is common. Right? It could be argued that this law was instituted due to the priests, at that time, getting drunk and doing things they shouldn’t. And these also reel with wine and stagger from strong drink: the priest and the prophet reel with strong drink, they are confused by wine, they stagger from strong drink; they reel while having visions, they totter when rendering judgment, Isaiah 28:7 NASB. If this was the only reason, then why would we also find the same law in the coming Kingdom that it will also be forbidden? Not only that, but the statute is said to be forever, just like the appointed times of Yahweh are forever. There is no time in between. If there were time in between, then forever loses its meaning. No priest shall drink wine when he enters the inner court, Ezekiel 44:21 ESV. This is a second witness, and we can’t ignore it. Those of us in Messiah are actually referred to in the New Testament as a symbolic kingdom of priests. One of the appointed times, which is a memorial of our High Priest, Yahshua, is the Passover in which the holy emblems are to be used before Yahweh’s presence. Symbolically, we are coming before Yahweh, though Yahshua, into the inner court and Holy of Holies at a time of worship; a time of reflection; a time in which no fermented drink is to be drunk.